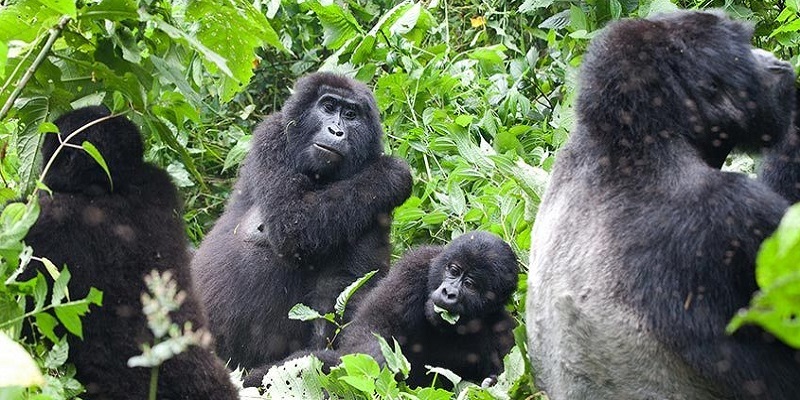 In this 10 Day Uganda Gorillas and Wildlife Fly out tour, you will have to have a tremendously long checklist to tick off all the wildlife and game. You primate treks with Chimpanzees and Mountain Gorillas We also have a very interesting cultural excursion to meet the amazing Batwa Pygmies of Bwindi, the original inhabitants. All in all this is a great value, express wildlife adventure that could only be done in The Pearl of Africa. Uganda is the only country in the world that can brag to have it all. Mountain Gorillas, Chimpanzees, Tree-Climbing Lions, Boat Safaris that get up close to Hippos, Major Game Driving Parks and Interesting Cultural Experiences. This is where you will explore all the best Uganda has to offer to tourists in the tropic Africa. Some of the activities in this tour include game drives in hunt for the Big 5 (African Lion, Leopard, Buffalo, and Elephant), excellent bird watching, gorilla tracking adventures, primates trekking expeditions, Cultural excursions, nature walks, fantastic launch cruise, and Day hikes among others. 1 x aero link Flight from KIHIHI TO ENTEBBE Airstrip to pp. 2 x Game Drive Permit’s pp. 1 x Gorilla Trek Permit pp. 1 x Lion tracking experience pp. Arrival at Entebbe international airport, you will be met by our knowledgeable expert guide and will be briefed about your itinerary and the pearl of Africa which is Uganda, later you will be transferred to your Hotel for resting. Overnight stay at the accommodation of Choice Emini Pasha, Lake Victoria Serena Hotel Or Protea Marriott Hotel. population of big game and primates. Visit the Top of the Falls and feel the force of the River Nile under your feet as the half a kilometer-wide river narrows to just 7m wide and cascades down through a 45m drop, known as the Devils Cauldron. The Falls are believed to be the most powerful natural flow of water anywhere on earth. Overnight stay at the accommodation of Choice Paraa Safari Lodge, Chobe Safari Lodge,Bakers Lodge Or Sambia River Lodge. DAY 3: GAME DRIVE IN MURCHISON FALLS NATIONAL PARK. Set off early morning on a game drive in the Nyamsika plateau to see the Cape buffaloes, Rothschild’s giraffes, Uganda kob, hartebeest and waterbucks. You may also spot oribi, bushbuck, Bohor reedbuck, shy sitatunga, bush duiker, warthog and bush pig plus large carnivores including lions, leopards and spotted hyenas. Chimpanzees and olive baboons head the list of six species of primates found in the park. During the afternoon enjoy a boat safari on the Victoria Nile River. Over a 17km stretch enjoy sightings of hippos, crocodiles, elephant, waterbuck and Uganda Kob. The boat will stop just tens of metres from the sinister, frothing and bubbling base of the falls where you can take pictures of the majestic Murchison Falls. species of primates including chimpanzee, red colobus monkey, the rare L’Hoest monkey, blue monkey, grey-cheeked mangabey, black-faced Vervet monkeys, baboons, pottos and bush babies. Overnight stay at the accommodation of Choice Primate Lodge Kibale or Crater Safari Lodge. DAY 5: CHIMPANZEE TRACKING IN KIBALE FOREST NATIONAL PARK. Today the forest opens its doors for an exhilarating chimpanzee tracking experience. Kibale Forest is reputable for having the greatest variety and highest concentration of primates in East Africa. Enjoy a guided nature walk in the tropical rainforest in search of the chimpanzee, red-tailed monkey, black and white colobus monkey and many others. Upon sighting the chimpanzees, you will spend an unforgettable hour with them as they go about their daily life – feeding, playing, grooming, taking care of their young, howling and screeching, in their natural habitat. Return to the lodge for lunch. Enjoy an afternoon at leisure or visit the Bigodi Wetlands Sanctuary for a nature walk – it is one of the many wetlands to visit in Uganda. The Sanctuary features 8 primate species, numerous other interesting mammals, over 200 bird species, many reptiles, and uncounted varieties of trees, shrubs and vines. Drive to Queen Elizabeth National Park (following the mystical Rwenzori Mountain range for most of the journey) and enjoy an en-route game drive to the lodge where you will enjoy lunch. Enjoy an afternoon game drive around the Mweya Peninsular and the Kasenyi mating ground of the Uganda Kobs, search for lions, elephants, buffaloes and other wild animals in their natural habitat or relax around the pool. Overnight stay at the accommodation of Choice Mweya Safari Lodge, Park View Safari Lodge or Enganzi Lodge. The day begins early as we start with a morning game drive, or you can book the lion tracking experience. The park’s diverse ecosystem of grassy plains, tropical forest, rivers, swamps, lakes and volcanic craters is home to an incredible abundance of wildlife. Look out for buffaloes, lions, elephants and other wildlife in their natural habitat. In the afternoon (from 15h00 to 17h00) enjoy a boat cruise along the Kazinga Channel, a natural waterway between Lake Edward and Lake George. This cruise will be one of the highlights of your safari as you sight abundant birdlife and view elephants, buffaloes and hundreds of hippos cooling off at the shores. Continue after the boat cruise with game drives in the Kasenyi plains area where you can find the Uganda Kobs, lions, elephants, buffaloes and more. DAY 8: TRANSFER TO BWINDI IMPENETRABLE NATIONAL PARK VIA A GAME DRIVE. The day begins early as we start with game drives. We head towards Bwindi, driving through the Ishasha sector, which is famous for its tree-climbing lions. While driving through the verdant countryside, you will pass traditional homesteads and enjoy panoramic views of the Rwenzori Mountains. In the afternoon arrival in Bwindi National Park, home of the endangered mountain gorillas. Overnight stay at the accommodation of Choice Haven Community Lodge, Bwindi Lodge or Gorilla Sanctuary. Early morning departure from the lodge to the trailhead at Bwindi Impenetrable National Park for your mountain gorilla tracking experience. After the briefing (touches on aspects of gorilla behavior, details on the gorilla family you’ll track as well as safety precautions) your adventure will start! Gorilla tracking can be strenuous, and a certain level of fitness is required. once-in-a-lifetime experience. Daily visits have an impact on gorilla activity patterns, and are a source of animal stress therefore the firm justification for the &quot;only spend one-hour” rule. This is adequate time for photography and observing these great primates in their natural habitat. Afterwards, return to base where your driver will be waiting to transfer you to the lodge to enjoy leisure time, or you can book the Batwa Experience. Known as the “Keepers of the Forest” the enchanting Batwa pygmies of Bwindi are a hunter-gatherer tribe that has lived side-by-side with the wildlife of this park for hundreds of years. The Batwa Experience is a hands-on historical and cultural encounter during which the Batwa demonstrate and describe their traditional way of life as hunter-gatherers.